Getting the opportunity to create with Jill Howarth’s latest collection with Riley Blake was such a wonderful honour and it was hard to choose which prints to create with. The Little Red In The Woods collection is a combination of larger illustrations celebrating Little Red Riding Hood and tiny smaller prints featuring tiny florals, bows and fruit. What’s not to love! Jill Howarth is a wonderful illustrator and surface designer creating nostalgic designs of sweet characters and has worked on numerous beautiful books and Riley Blake fabric collections. While not a Christmas collection the mint, white and red colours are perfect for any handmade Christmas gifts you plan on making! I used the free tutorial from Lindsay from Primrose Cottage Quilts Instagram page to make 4.5 inch tiny present blocks. By adding another strip of fabric to the block I was able to make a perfectly sized heat/cold pack. Once you’ve decided on your size you just need cut a same sized backing piece of fabric and with right sides together stitch around the edges using a ¼ inch seam and leaving a 1 ½ inch gap. The gap will then enable you to turn the rectangle out and you can then fill it using either dry rice or wheat. If you do use rice you will need to add a cup with water in the microwave so the rice does not dry out. The next project I made was a mini quilt using drunkards path blocks. I hadn’t made this type of block before but I wanted to showcase the larger beautiful scenes and twirling curved blocks seemed the perfect accompaniment (You can follow a free tutorial on the Love Patchwork and Quilting website) I then hand quilted the blocks using 12 weight aurifil thread and then used a Riley Blake Basic print, 1/8 inch striped print in Sweet Mint, for my binding. My final project was a cushion for my youngest daughter’s bed. I choose to use the Mandolin English Paper piecing pattern from Tales of Cloth. The block features lots of opportunities to showcase the Little Red in the Woods illustrations. I fussy cut my pieces using the acrylic templates and then hand quilted the pieces together. I also hand appliqued the block to the Riley Blake striped print and used Aurifil 12 weight thread in 1148 to keep with the pretty aqua tone of the prints. I was so excited to create with Jill’s collection and am looking forward to making a few more Christmas gifts with these sweet collection! Welcome to my stop on the Zakka Home Book tour. Zakka Home is the latest book written by the very talented Sedef Imer from Down Grapevine Lane and is her second publication with Tuva Publishing. Sedef’s book is a beautiful collection of small and large projects, and perfectly showcases her wonderful aesthetic of sweet and modern. I made it using a selection of fabrics from my collection and stitched the houses to a piece of cotton ribbon – you could also take this bunting idea and theme it for Christmas or any occasion. And their tiny size means they are perfect for using up your favourite scraps. The second project I made was Sedef’s sweet pouches. They are a fantastic size for gift bags or even storing little trinkets (I’ve been using mine as busy bags to keep in my handbag and keep my children entertained when we are out and about). Jill’s collection is perfect for fussy cutting and the pouches are the perfect size to showcase the cute illustrations. The Zakka Home Book tour has been so much fun to be a part of and I’ve adored seeing how the same patterns can look different depending on the creator and their selection of fabrics and accessories. Below is the full list of participants, definitely worth popping in having a look at their posts. Tomorrow Sarah will be wrapping the Tour and I can’t wait to see what she creates! Earlier in the year the Fat Quarter Shop advertised on Instagram the opportunity for bloggers to work with them on their upcoming sew alongs. I jumped at the chance and had the opportunity to preview the quilt along commencing today. The Spool Souffle quilt is part of their shortcut series and features 8 by 10 inch sized blocks. I made my quilt using a layer cake from Cotton and Steel featuring the Print Shop collection by Alexia Abegg. My background print is a Kona Solid in PFD Bleach White which I quilted with Aurifil 50 weight thread in 8021. This is the biggest quilt I have ever made and it all came together in one weekend, guess that is why its part of their shortcut series! 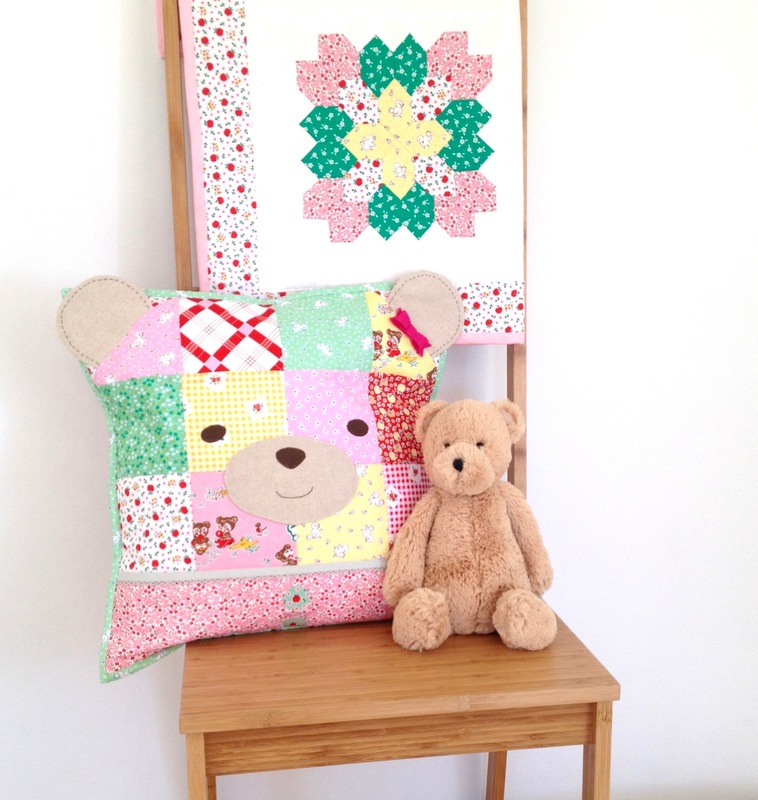 Further details about the quilt along is on the Fat Quarter Shop blog Jolly Jabber. Welcome to my turn on the blog tour for Jemima Flendt’s debut book with Fons and Porter – Weekend Quilting! The sub title for Jemima’s book is Quilt and Unwind with Simple Designs to Sew in No Time and that is a perfect summary of the book. Jemima’s debut publication covers a range of techniques from english paper piecing to raw edge appliqué and if you haven’t tried one of those before, don’t worry because the book gives you step by step instructions and illustrations to create simple yet beautiful pieces. I also love that Jemima has used a variety of colours and prints for each of her projects, which really shows the impact these selections can have on your project. The first project I made was the Avenues Mini Quilt project which uses foundation paper piecing. I have only paper pieced a few times before. However Jemima’s fantastic guidance filled me with confidence so I decided to make that particular mini to help Jera Brandvig’s showcase her latest collection with Lecien Fabrics La Conner at Spring Quilt Marker 2017. For the blog tour I decided to make another foundation pieced quilt, this time one of the projects from the front cover. The sparkles mini quilt uses foundation paper piecing and is great way to use some of your favourite scrap pieces. I decided to add a border to the mini as I made it for my soon to be here niece as a baby quilt. I selected the Teacup Pavillon Print from Amy Sinibaldi’s Charleston collection with Art Gallery fabrics. I tried to pick up the key colours in the print by using fabrics that featured red, green and blue as well as adding a few yellow tones. For my low volume background I used the text print from Amy’s collection Paperie andtried to match the tones with a few other prints I had in my collection. I hand quilted the quilt using Aurifil 12wt thread in 2026 (a pale cream thread). Finally I backed my mini with double gauze which is hands down my favourite backing to use as it seems to get softer and cosier with use. And I definitely make my quilts to be used. I have already started on my next project. The raw edge appliqué project titled Blooms Mini Quilt. I got some of the acrylic templates for this project from Ministry of Project (being see through they are fantastic for fussy cutting) and my test piece turned out so well I can’t wait to make the mini with all its gorgeous blooms and pretty leaves. Thank you so much for joining me on my stop for the Weekend Quilting blog tour and most importantly you can now buy Jemima’s book direct from Jemima’s Tied With A Ribbon webpage or from most book stores including Amazon and Book Depository! If you are on instagram make sure you check out the latest #weekendquiltingthebook, #weekendquiltingshowcase, #weekendquilting, #tiedwitharibbon, #tiedwitharibbonpatterns, #fonsandporter hashtags to see all the amazing projects that have been produced so far. And then on Monday pop over Heather from the Quilt Story blog to see what project she has chosen to showcase. 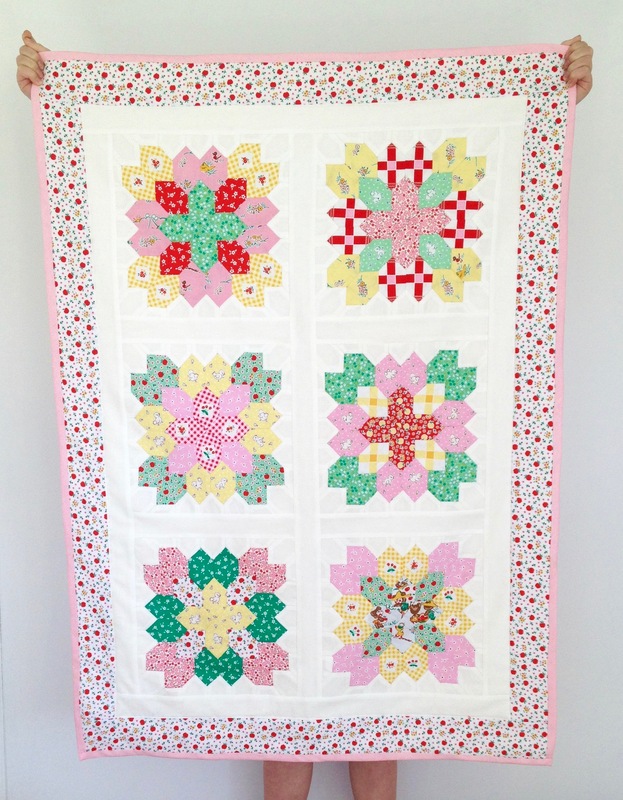 Welcome to my turn on the Quilt Petite blog hop! Quilt Petite is Sedef Imer’s from Down Grapevinelane first book which she has produced with the brilliant Tuva Publishers. The first thing I notice about Quilt Petite is what a true representation of Sedef’s beautiful style and creative process the book is. It features a wide range of sewing techniques from hand quilting, embroidery, english paper piecing and foundation paper piecing. Sedef is a self taught quilter and the book reflects that, each technique features step by step instructions as well as extra tips to help you learn. I am a complete novice when it comes to embroidery and foundation paper piecing however this book is now my go to guide! Ok so the title might make you think that this is a book solely about mini quilts, however it features pretty quilts and so much much more! 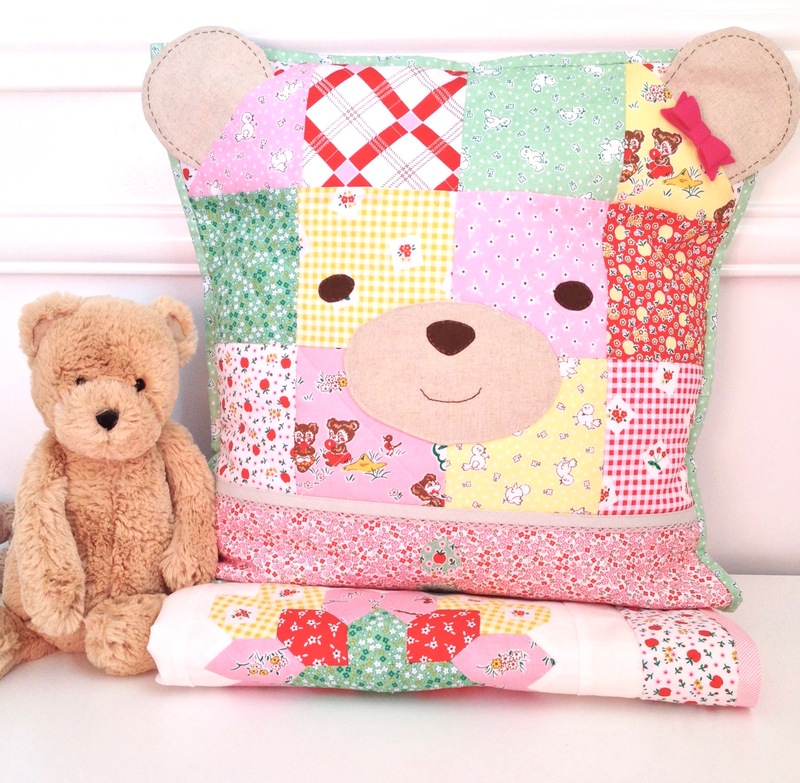 Quilt Petite has 18 projects (all as sweet and inspiring as each other) which will have you creating the cutest cushions, mug rugs and placemats. Each project has such detailed photos and instructions its ideal for both those new and old to sewing. So what project did I choose to create? Well for my turn on the blog hop I choose the Quilted Noticeboard. I used fabric from Sedef’s debut range Sweet Orchard, Strawberry Biscuit by Elea Lutz and The Simple Life by Tasha Noel . The Noticeboard was a lot of fun to create, if you can cut and sew in a straight line then this is the project for you ( and my favourite type to make). I added a few personal touches with a handmade tag from Cheri of Tinker With This and the pretty strawberry button from Alisha’s store Ministry of Fabric (its also where I bought the Pelon Flex Foam that used for the inside of the Noticeboard). Of course with a book as sweet as this I couldn’t just make one project. I made the Flower potholder which may or may not be too sweet to use…….. The blog hop has only just started and has already featured some amazing makes from some super talented ladies. And I can’t wait to see what beautiful project my fellow Aussie Lauren from Molly and Mama posts tomorrow. Sedef has the Quilt Petite blog hop schedule with the full list of bloggers being featured and if you pop over to her blog make sure you enter her Quilt Petite giveaway! You could win a bundle of sweet gifts like the book, hard to find sewing notions and a super cute tin to store it all in. Last week I was very excited to receive a gift from Dear Stella Design – a gorgeous bundle of Rae Ritche’s latest fabric collection Dreamscape! Dreamscape was released in September and builds on Rae’s previous gorgeous collection Moon Garden. It features soft tones of navy, purple and cream – making the collection perfect for so many projects (especially when you see that the collection features sweet mama elephants and their babies, galloping horses and an elegant floral design). I think the collection would be especially perfect for a handmade gift for expectant parents! So I decided to make a gift for my friend who will be having her third baby and her first girl. I adore pink pretty prints however she does not. So when I showed her the collection she fell in love with the pops of navy and purple. And the soon to be big brothers adored the cute elephants! I decided to make her a few cushions for the nursery. I used the pattern from Kerri Horsely’s book Lovely Little Patchwork. I have made this pattern before and knew it would work perfectly as I really wanted to showcase the elephant print (and the 5 inch square centre would be ideal). I separated the bundle into the light and dark tones and was amazed at how different the two cushions looked. It was a real lesson in the impact colour and print placement can have on your project! Hopefully I have inspired you to create and if you adore Dreamscape as much as I do ask for it at your local or online fabric store.